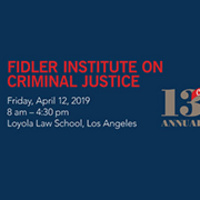 Loyola Law School is hosting its 13th annual Fidler Institute on Criminal Justice on Friday, April 12, 2019. Each year, the Fidler Institute on Criminal Justice addresses hot-button topics with nationally renowned members of the legal community. The day will be capped by a judges’ reception and the presentation of the Fidler Awards.